Ergotech: Transforming Your iPad into the Most Versatile Gadget You Own, With the VersaStand for iPad! Transforming Your iPad into the Most Versatile Gadget You Own, With the VersaStand for iPad! In our last post, we discussed the upcoming release of Ergotech Group’s VersaStand, the “best iPad desktop accessory yet” according to CNET’s 2013 Product Review. We had mentioned how the product will increase your ability to utilize your iPad in many different environments, so let’s now go over the four different mounting options that the VersaStand will provide in order to make this possible. Let’s start with the Desk Stand – the most anticipated VersaStand mounting option which will be released by September 2013. 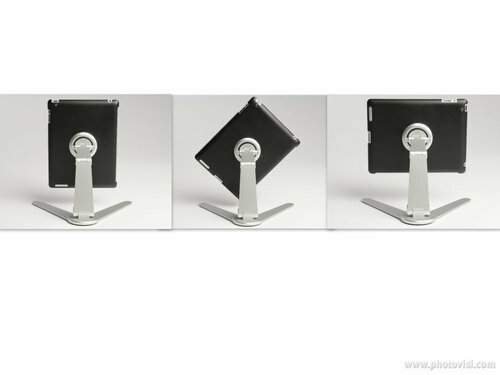 This folding aluminum Desk Stand is compatible with the iPad 2, 3, 4 and Mini. Once your iPad is attached to this desktop accessory, the Desk Stand will secure stability for your device and display it at optimal, ergonomic, glare-free viewing angles. The Desk Stand facilitates the fluid 360 degree rotation of your iPad which allows you to effortlessly switch between portrait and landscape orientation. Composed of industrial strength aluminum and weighing just slightly over 1 pound (1.2 pounds with the rubberized hard case included), the Desk Stand will be the first portable iPad stand on the market. The Desk Stand fully extended is 9.5 inches tall, and the maximum width of its legs is 11 inches. When folded, the stand is 9 inches in length, 3.25 inches in width, and 1.5 inches in height. Its ability to fold down so compactly enables you to easily store the stand in a small bag for travel. The Desk Stand has 3 fully articulating movement points which enable effortless rotation and adjustment of your iPad’s orientation. 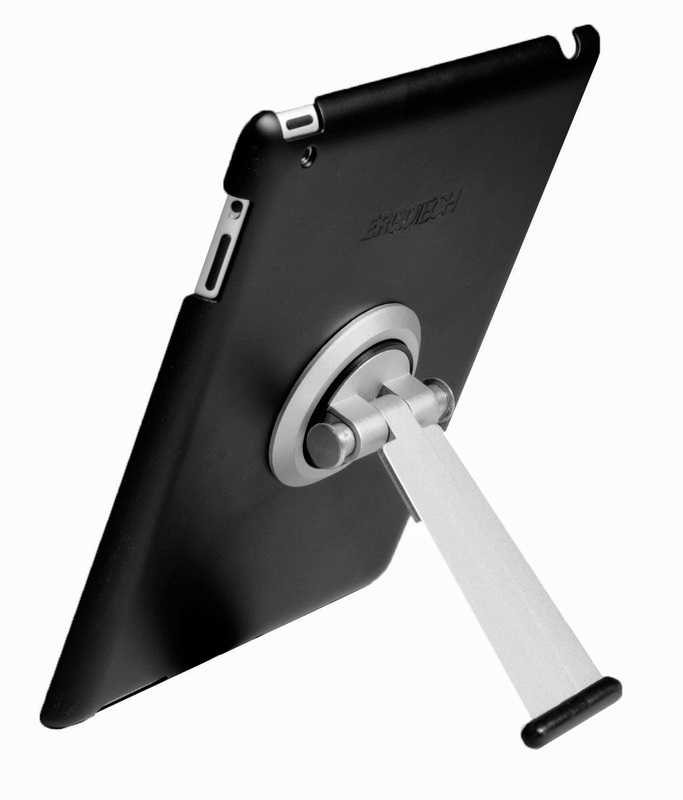 Each joint is sturdy enough to ensure that your iPad will remain wobble-free in all positions. With your iPad attached, the Desk Stand fits perfectly on a desk next to a laptop or desktop setup, and its sleek, silver finish which matches the color of the iPad will keep your workstation looking as professional as ever! You can even set up a keyboard at your desk in front of your iPad and VersaStand and watch as your Apple tablet transforms into that incredibly lightweight desktop you’ve always wanted. The remarkable stability that the Desk Stand provides for your iPad can also simplify still photography, video, and Facetime, and even serve as a sturdy holder for watching movies or TV shows. Evidently, this one mounting option alone will provide you with endless possibilities for the use of your iPad. 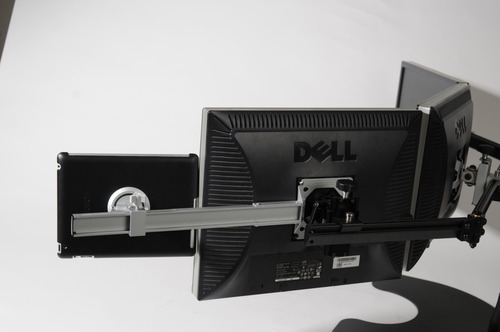 In addition to the Desk Stand, the VersaStand Side Monitor Mount is designed to conveniently mount your iPad alongside your workstation monitor, thus allowing it to serve as a second monitor or viewing option for your desk. The difference between this and the Desk Stand is that the Side Monitor Mount will allow for easy viewing and use of your iPad at your desk while simultaneously freeing up valuable desk space!! The Side Monitor Mount can be adjusted to fit 17” standard and 24” widescreen monitors, and it will enable full rotation of your iPad as well as full range of motion along multiple planes. So if you like the idea of using your iPad at your desk, imagine how great it will be to have the ability to do so without cluttering your desk space!! Next, we have the VersaStand Surface Mount which will provide a whole new level of display for your iPad. The Surface Mount will allow for hands-free viewing of your device by mounting it under the kitchen cabinet, office cabinet, or directly on a wall or desk at home or in the office. Just like the Desk Stand and the Side Monitor Mount, the Surface Mount will allow for the 360 degree rotation of your iPad. Not only this, but the Surface Mount will also rotate 360 degrees at the base of the unit. It will consist of an articulating arm that will provide maximum flexibility for your iPad and thus enable you to view your device at optimal ergonomic angles. You will be able to fold this mount to within 1 inch of your mounting surface. By enabling you to mount your iPad under any cabinet and to any wall that you choose, the Surface Mount will remarkably increase the variety of the environments in which you will be able to use your Apple tablet. If you enjoy reading recipes and listening to music in the kitchen while cooking, the VersaStand “under cabinet” Surface Mount will be the perfect iPad mounting solution for you!! Finally, if you enjoy capturing pictures and videos with your iPad camera, you will love the VersaStand Kickstand/Hand Mount. This mount consists of a unique rubberized Kickstand foot that will attach to the back of your iPad, securely hold it in place, and prevent any slipping. With this Kickstand foot, you can position your iPad on any flat surface or you can easily hold your iPad while picture or video taking. This mount is perfect for capturing that special moment with your iPad camera as it can be used to maximize your camera angles! The Kickstand/Hand Mount conveniently folds down to a thickness of just one half of an inch and is therefore portable for easy transport. It doesn’t get much better than that!! So if you’re looking to enhance the versatility of your iPad, Ergotech’s VersaStand is, without a doubt, the answer for you. As the four different mounting options are released over the next several months, watch how the VersaStand will transform the way you use your iPad on a daily basis!!! While the Desk Stand will be coming out in September, the release dates for the other three mounting options have not yet been determined.